Common and widespread at low and middle elevations throughout four-county area. Nests generally below 3,000 feet in variety of habitats, including forest clearings, orchards, wetlands, bogs, riparian corridors, parks, and neighborhoods. Requires small trees for nesting adjacent to suitable foraging opportunities for berries and insects. Prefers deciduous growth, so may be increasing in residential areas where ornamental tree plantings have replaced conifer forest. 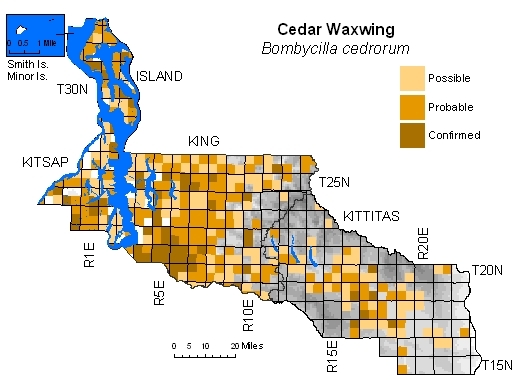 Utilizes Russian olive groves in Kittitas County, but absent from much of steppe zone. 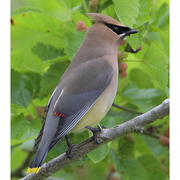 Transient birds well into June may skew true breeding distribution.